motorcross gear for the tuff n gritty dirt tracks. Want to look like an ama motorcross rider? Motorcross Gear - The Right Stuff for Dirt Biking. The world of dirt biking is one of the most exciting and thrilling you will ever come across, as no doubt you already know if you are planning to get into it. The adrenalin that dirt biking can create is something that is quite rare, even if you take into account other sports. However, like every other sport that incites an adrenalin rush, dirt biking is also a sport that is full of risks. As a result of these risks, the bike riders are required to protect themselves with all that modern technology can provide. Therefore, motorcross gear or motocross equipment is a critical point of dirt biking. 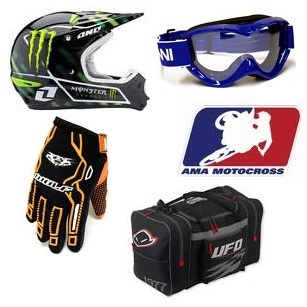 The following are some examples of what motorcross gear is required and how every item protects the rider. If you have ever ridden a bike then you already know the utmost importance of this piece of equipment for the rider. Bikes are dangerous and they are most dangerous because the rider's head is not automatically protected. However, when you put a bike on a dirt track and make it fly, slide and land like dirt bikers do then the helmet becomes indispensible. On a dirt track, accidents, slips, falls and collisions are inevitable and this is why a helmet is critical for the rider's safety. A helmet should ideally be both comfortable and strong for the rider. Things to look for in good motocross helmets include the sturdiness of the material, proper ventilation, proper padding and the right fit. Five other items of apparel to keep you un-broken. While the helmets protect the head and a part of the face, they do leave the eyes open to injury. On a dirt track, eye injuries can also be critical because of the loose earth that gets kicked up. Therefore, goggles are a part of motorcross gear that would protect the eyes and any part of the face that is exposed. Some specific qualities of good motocross goggles include clarity, shatter resistance, comfortable strap and facial padding. Since dirt biking is all about speed and maneuverability, it is crucial for the rider to be as comfortable and unburdened as possible. Normal clothing can restrict while, at the same time, not provide the same level of protection. Therefore, motorcross gear in terms of jerseys and pants are usually extremely flexible, light and well ventilated. The foot of a motocross rider can take a lot of damage from grinding and the landing impact, which is why it needs to be heavily protected with the help of high quality boots. While being comfortable, motocross boots should be able to absorb the landing impact from a jump and also take the grinding that can happen on a turn. On the other hand, the gloves worn by the motocross rider do not need to be so heavy duty. Motocross gloves need to provide proper grip and maneuverability in addition to ventilation. 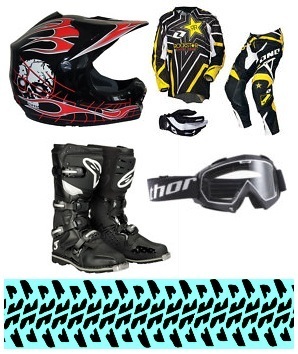 The above mentioned motorcross gear mainly covers the most important items that dirt bikers use. Also many riders will buy things like, neck braces, body armour and chest protectors for extra protection. Furthermore, while certain qualities may be the same for all riders, you would have to evaluate the equipment yourself when purchasing it. Perhaps use some of the free motorcross videos online, that show off the latest mx buys out there. Of all the gear the helmet is the most important. You don’t need me to tell you that – but ensure your helmet is dot and snell approved, and also your other MotoX equipment comes up to (or surpasses) the basic minimum safety requirements. If it doesn’t, it’s not really worth the price you paid, no matter how cheap it is.